I am beginning to bet you don’t believe me when I say I was not going to post a recipe and I do. I WAS going to post a picture of the first toast I made on my Facebook page, but then when I sat down and started eating it I changed my mind. Then my hubby made yummy noises the entire time he was eating it and it confirmed my “need” to post it on my blog and tell the whole story. In my last post I talked about my fabulous day in Santa Cruz after teaching a Nia class. I mentioned two restaurants. The one we love, Rebecca’s, is closed. I was very sad because it has really yummy food and is a very nice place to eat. But, I also recognized this as an opportunity to try a new place. Having other things to do I didn’t do any research, but my student did. Yay! She suggested River Cafe. It was on the way to where we were going. So we went there. They have a menu item called “The Daily Toast”. When we were there it was supposed to be Humboldt Fog*, Pears, walnuts, and the woman behind the counter said they would drizzle honey over it. Sounds good, huh? I ordered that. A few moments later a woman came to our table and said she could not find the pears, but she said she had persimmons or jams. She suggested the jam, but I declined and requested the persimmons. I had some on my counter I didn’t know what to do with. I thought this would be a great way to experiment. Well, even though the persimmons weren’t ripe, they forgot the walnuts and the honey (as you can see in the first photo), it was still VERY good. So good that I wanted to try making it the next day. We didn’t have any salty cheese so I decided not to. But then the NEXT day I decided who cares. I wanted to try it anyway. I asked my hubby if he wanted cheese toast. He said yes. Then I asked if he wanted regular cheese toast or an experiment. I have mentioned before he is pretty good about eating whatever, but he does have some food “dislikes” so when my experiment includes some of them I like to ask first. Anyway, this turned out very yummy. It is easy to make but comes out – in my opinion – kinda fancy. I have noted the recipe as I made it, but, I think the idea of the River Cafe is better in regards to the cheese. A nice soft salty, flavorful cheese seems best, but I used what I had. Toast the bread, not all the way (at least with my toaster oven. I have to leave it a little “undone” so it will be perfect after the cheese melts). Top the bread with the sliced cheese. Melt the cheese on the toast. 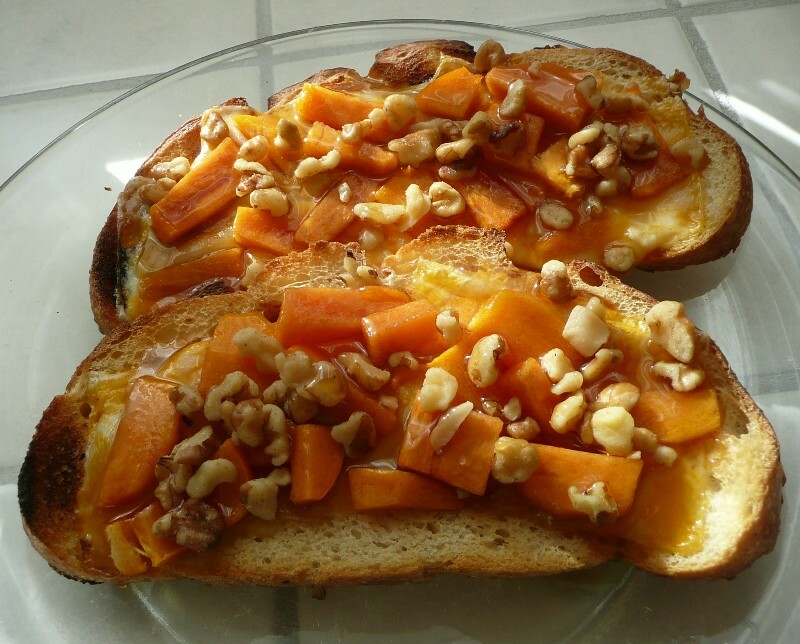 While the bread is toasting and the cheese is melting peel and slice the persimmon. 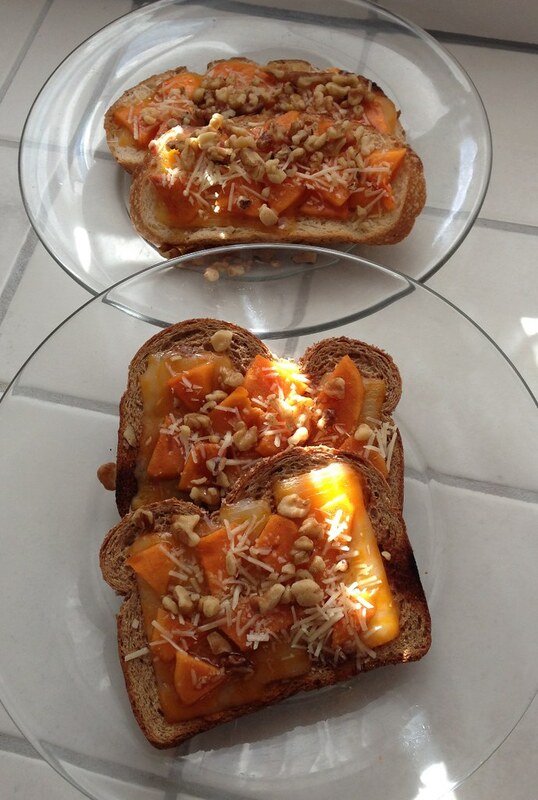 After the cheese has melted, place the persimmons on the toast, sprinkle the parmesan over the persimmons. Allow to warm a bit in the toaster oven/oven. Then sprinkle the walnuts on the toast. and drizzle the honey over the top. Serve with a fork and knife! I was thinking that this would be an easy type of toast to serve for brunch. Toasting the bread in the oven on a cookie sheet. I also thought it would be a nice toast to serve at a tea. Yum. I used the parmesan as the “salty” and it turned out pretty good. I was surprised my husband liked it so much. He is not fond of bread, especially toast. Not like me. He also doesn’t care for walnuts. So it is a testament to its yumminess that he loved it. Well? What do you think? Sound yummy? *Humboldt Fog is a specific type of cheese: Cheesemaker Mary Keehn of Humboldt County, CA invented this cheese, so named for the Pacific mists, in the early 80’s. (According to Wiki). This entry was posted on November 26, 2013 at 2:14 pm	and is filed under "Recipes", Food. 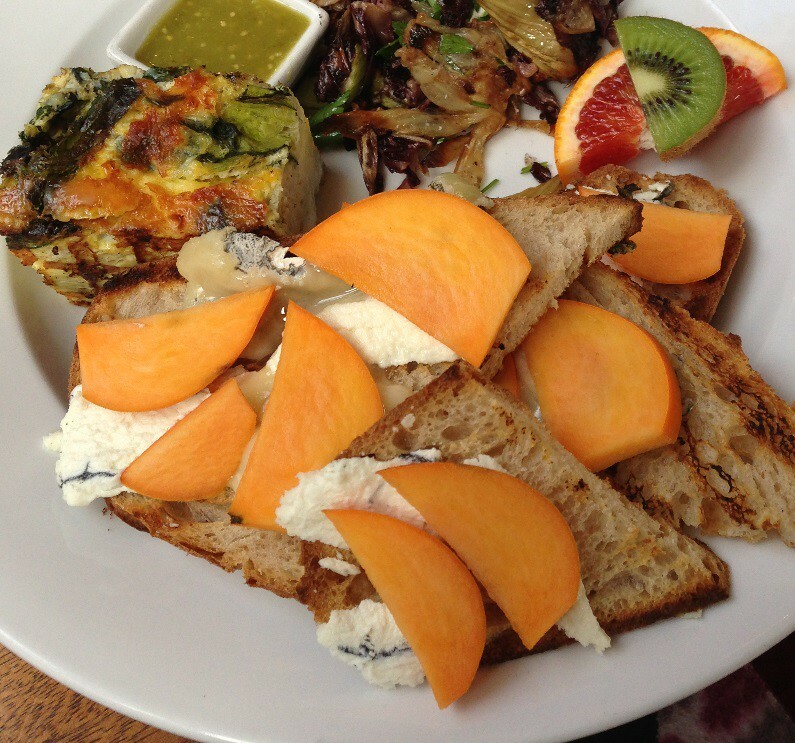 Tagged: breakfast, breakfast for a crowd, brunch, easy breakfast, Fancy toast, goat cheese, Humboldt Fog, Nia, Nia class, Nia student, Nia Teacher, persimmons, Rebecca's, River Cafe, Santa Cruz, teaching Nia, toast, walnuts, yummy breakfast. You can follow any responses to this entry through the RSS 2.0 feed. You can leave a response, or trackback from your own site. Oh Dwight, that would be awesome. The first picture is the restaurant version (as I said, walnuts and honey forgotten) but it came with a side. They gave us the idea that we could split a side and have two different ones equaling on portion. I am sure you can come up with a perfect combination for your restaurant. I bet people will love it. It is sooo yummy! Oh yeah, it was super yummy! That sounds heavenly! I’m going to have to try it though I’m not sure if I can get persimmons here in Maryland. Seems there must be some place to get them. Not like I live out in the sticks or something! Ha. Ha. I have been on a Focaccia bread making kick in preparation for a soup and focaccia party we are having on Friday. I made two today. One was topped with salt, rosemary, sun-dried tomatoes and black olives. The other with Italian herbs, extra rosemary, red onion, artichoke hearts and sun-dried tomatoes. Tomorrow I will make a plain one with salt and rosemary and parsley. The last one is going to be spinach and feta. I don’t know much about persimmons. I was thinking about maybe posted about them next post. I love Focaccia bread. Yours sound delicious. What a fun party to have! It looks so yummy. Anything with cheese and walnuts is my hubby’s favorite. So I am definitely going for this. It is easy to make and so nutritious for health. Lovely recipe my friend. Take care and God bless. Thank you again, so much for visiting, reading, and commenting on my blog. Cheers! Pleasure is mine. I always enjoy reading your posts and learn so much from them. So thanks for sharing them with us. take care and God bless.